Submit your email for notices of upcoming classes. Opt out any time. Addresses are purged after 120 days. Primarily for somewhat intermediate shooters, this is an introduction to Tactical Training, and is offered privately or in small groups (2-4). 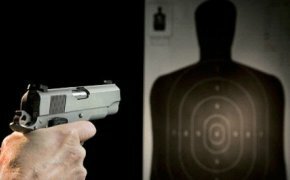 Most people who own a handgun practice at commercial ranges (which usually disallow holsters), standing in one spot, shooting at one target from a ready position, and using slow, deliberate fire to maximize marksmanship. While this is a necessary step in your development, it does little good when you are faced with an armed carjacker in a parking garage. This course is taught entirely at a private outdoor range NE of McKinney. Students draw and fire at FBI targets, do rapid-fire and timed drills for marksmanship, shoot at multiple targets, shoot from concealment, and reload during timed drills. Students will also learn flash-picture acquisition. The goal is to maximize speed, accuracy, and efficiency. Most civilians respond poorly in a crisis situation, because they have not trained enough to have muscle-memory instincts. Changes in adrenalin levels and blood pressure will cause fine motor skills to dissipate, leaving only muscle-memory between you and disaster. This course is intended to give you the tools and confidance to develop those instincts.